We’ll get to know Bonnie during her wholesome, hardscrabble upbringing, leading up to the day Clyde enters the picture, and she becomes a gangster’s moll. 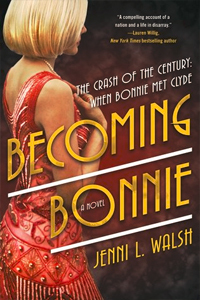 It’s a fun, vivid account that adds to the myth of Bonnie, while keeping us grounded in history. The book has gotten such rave reviews by the way, that there’s already a sequel in the works: Being Bonnie hits in 2018. Visit our guest at JenniLWalsh.com or follow her on Twitter at Jenni L Walsh.